Spurs are a traditional training aid that have been used by experienced horsemen and horsewomen for decades. There is a correct and incorrect way to wear a spur, though personal preference and riding discipline may somewhat alter the positioning of the spur. It is important that you wear your spurs correctly or they will not communicate effectively with your horse and may even cause problems. Western spurs are U-shaped metal devices that often feature a spiked rowel that comes out of the very center of the U on a metal bar called a shank. 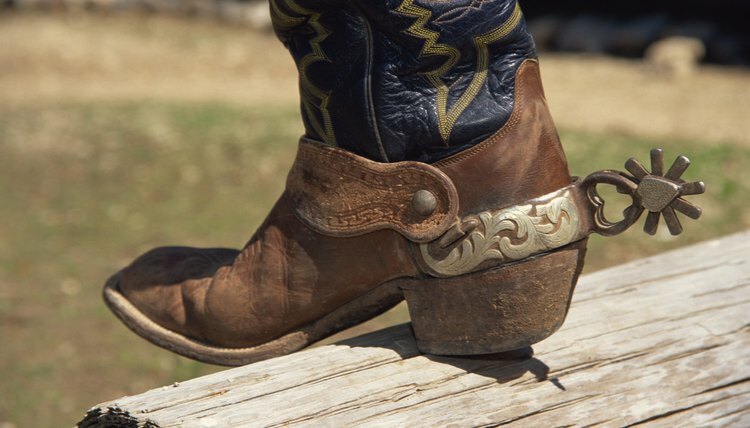 When you put the spur on, the U shape -- officially called the band -- should fit snugly around the heel of your boot with the rowel pointing backward away from your foot. The spurs also feature built-in metal buttons that appear on either side of the front of the U. Those buttons are used to attach the spur straps. Spur straps are leather straps, which are used to keep the spur from coming off the rider's boot while in use. The spur itself should sit snugly on the heel of your boot. There is a spur rest at the back of most boots. It is the small ledge between the very top of your boot sole/heel and the leather of the actual boot. A properly fitting spur should slide snugly onto the boot's spur rest and feel relatively secure there on its own. Note that some professionals may choose not to use the spur rest, but this is something that only an expert should make a decision about. Generally, you want your spurs to sit on the spur rest unless being specifically instructed otherwise by your riding instructor or trainer. Attach your spur straps to your spurs by sliding the button openings over the buttons on the spurs. The buckles and other decorations should face outwards from the leather of your boot. You can adjust the fit of the spur strap by using the buckle or fastener in the center of the strap to tighten or loosen the strap. The buckle on the spur strap should face the outside of your foot. You want your spur strap to be snug across the bend where your foot and ankle meet. You do not want your spur strap to be loose enough that the spur can wiggle or move during riding, but you also shouldn't tighten it so tightly that you immobilize your own foot and give yourself blisters. You want a comfortably tight fit that doesn't interfere with your ability to use your foot. Spurs come in different sizes, typically youth, ladies and mens. Take your boots with you when you go spur shopping to ensure that the spur fits snugly when you purchase it. Spur size is difficult to change and you will not be able to significantly alter the fit of a spur that is just too small or too big for your heel. Spur straps can be purchased based on size. Pick the size that accommodates your foot comfortably. It is best to simply bring your equipment to the store where you will be making your purchases and try on spurs and spur straps. The specific design of a spur or spur strap can affect the fit significantly. English spurs and spur straps are a different design from western spurs, though the basic fit guidelines are the same. English spurs have a small blunted or rounded shank and no rowel. The tip of the shank always needs to be angled downward. Your English spur needs to fit snugly around your heel and sit comfortably just above the spur rest of your boot. English spur straps are long leather straps that run through the two-holed openings on the ends of the spurs and then buckle across the top of the foot. They essentially form a leather loop around your foot, with the bottom of the strap being run just in front of the heel of your boot on the underside and the top running across the bend where your foot and ankle meet. It is generally viewed as proper for the buckle on an English spur strap to face the outside of your foot. You can pull the strap through the holes in the spurs as needed to get the buckle into the right general position. The strap should fit snugly against your foot when tightened, but not impede mobility.